SCVHistory.com | Pico Canyon | Some Notes About Alec Mentry's Birth Name. Until we see his French birth certificate, we might not be fully certain of the birth name of the man who, in 1876, put California on the "oil map" of the United States at a place called Pico Canyon, a few miles west of present-day Newhall. In his 1985 book, Pico Canyon Chronicles, SCV historian Jerry Reynolds gives Charles Alexander "Alec" Mentry's birth name as "Menetrier" and says he emigrated to the U.S. with his parents in 1853, at age 7. Elsewhere, Reynolds says the name was "Mentrier" and gives a birth year of 1846. Mentry's death certificate says he was born March 27, 1847, but the death certificate is inaccurate. It says he was 52 years, 6 months and 8 days old when he died Oct. 4, 1900 — and that would move his birth to 1848. And it doesn't show a birth name. A distant relation from Glendale, Calif., provides a different spelling. "His name was Menestrier," Harry Minetree tells us in a communication of Jan. 19, 2014. "The name was changed to Minetree in England. (The common ancestor) was a French Huegonot, a Protestant, exiled from his country by a Roman Catholic French king in the mid-1600s. The Menestriers go back to the Middle Ages when the name was spelled Mennestrier; they were a large group of wandering minstrels, noblility who codified Courtly Love. David Minetree, who came to the New World in the late 1600s, was the designer and builder of Carters Grove, a famous plantation on the James River in Virginia. I am Harry Minetree, from the Virginia Minetrees." 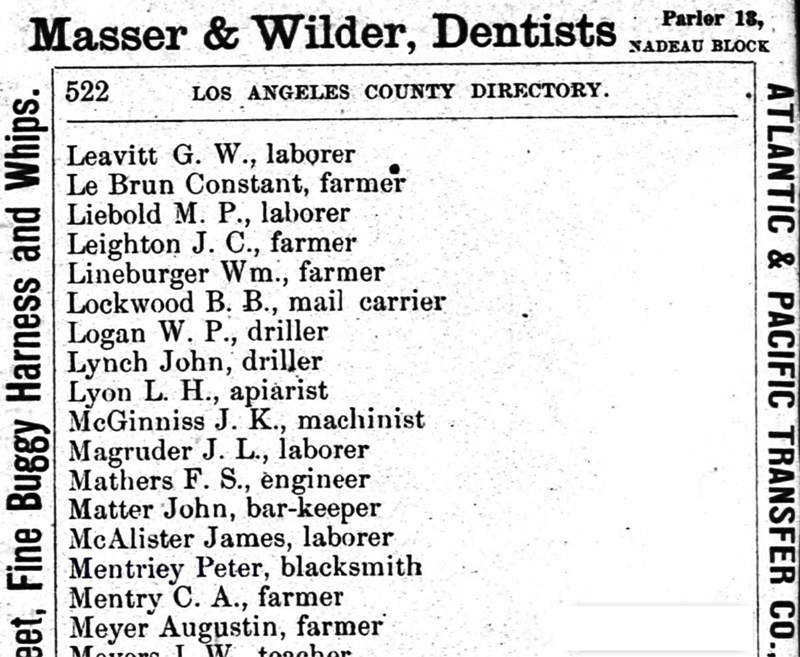 L.A. County Directory 1884. Click to enlarge. The Los Angeles County voter registration roll for 1884, shown above, offers another variation. Alec, then 38 (suggesting a birth year of 1846), registered to vote as "Mentry." But his 75-year-old father, Peter, used the name, "Mentriey." He's also shown as Peter Mentriey in the Los Angeles County Directory for 1884. The voter registration listing tells us Alec became a naturalized U.S. citizen by virtue of the naturalization of his father, which occurred Oct. 6, 1863, at Crawford, Penn. Titusville, Penn., where Alec first went to work as an oil driller, is located in Crawford County. On the 1884 voter rolls, Peter is listed as a blacksmith, which makes sense, while Alec is listed as a farmer, which doesn't. It's probable that the rough pronunciation of Mentriey was "Mentre," inasmuch as that's the spelling used in the newspapers when Peter went missing two years later (1886), never to be seen alive again. Peter's voter registration provides a birth date but not a year; the the news reports say he was 77 when he went missing in August or early September of 1886, but since his disappearance was so close to his birthday (Sept. 25), we don't know if he was born in 1808 or 1809.